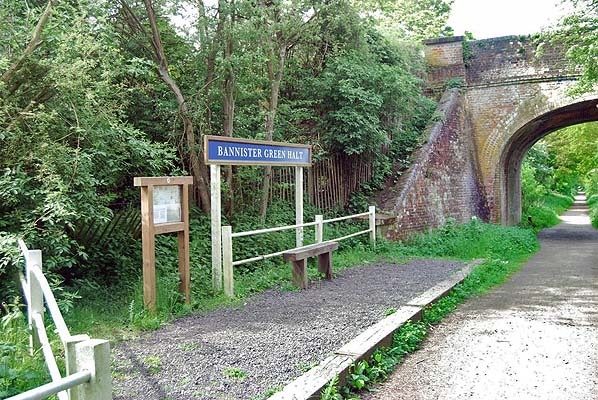 Notes: Bannister Green Halt was sited on the up side of the line and consisted of a clinker platform with timber facing raised to rail level; it was attended by staff from Felsted or Rayne Stations. It was one of two halts built by the GER in 1922 to attract passengers to the railway and counteract the then recently introduced bus service. Passengers joining or alighting at the halt were required to use retractable steps mounted by the side of the coach and operated by the guard. Access to the halt was a sloping path from the road. There was one oil lamp and a name board on the platform. 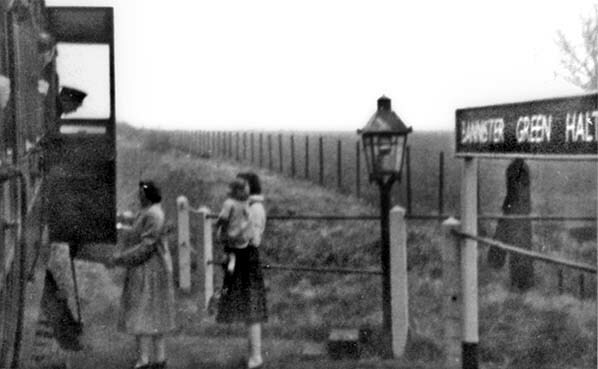 Having closed in 1952 the halt appears to have been removed before the track was lifted. 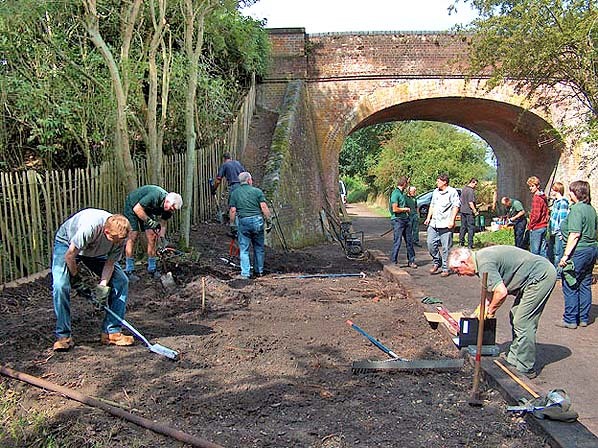 In July 2011 the Friends of Flitch Way began work to reinstate the halt. A series of photographs of the project can be seen on their web site. The halt is now an access point onto the Flitch Way. The first turf was ceremonially cut at Dunmow on the 24 February 1864 and contractors began work the following day. 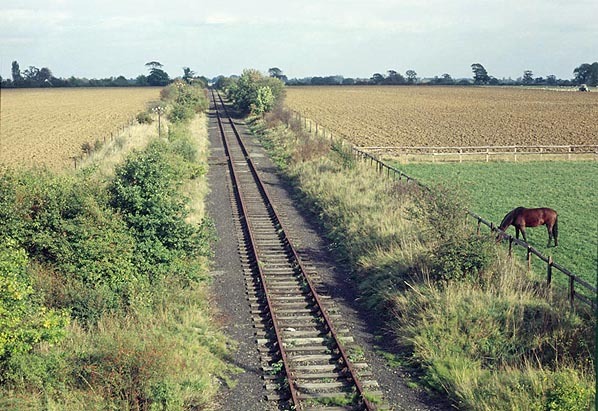 Virtually the entire length of the branch line's 18 mile route was single track, except at Dunmow and one or two other stations where dual track allowed trains to pass each other. The line was finally opened for passenger use on 22 February 1869 with intermediate stations at Takeley, Felstead & Rayne. Further stations were later added, Easton Lodge in 1894, Hockrill Halt in 1910 and Stane Street and Bannister Green Halts in 1922. 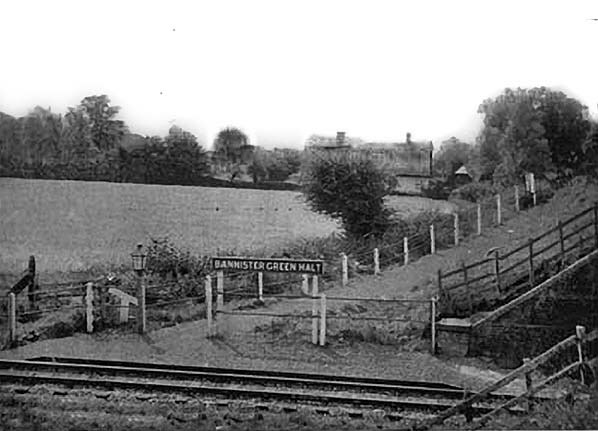 Bannister Green Halt c 1930s. 1953 1:2,500 OS map, note the path down the bank from the road. 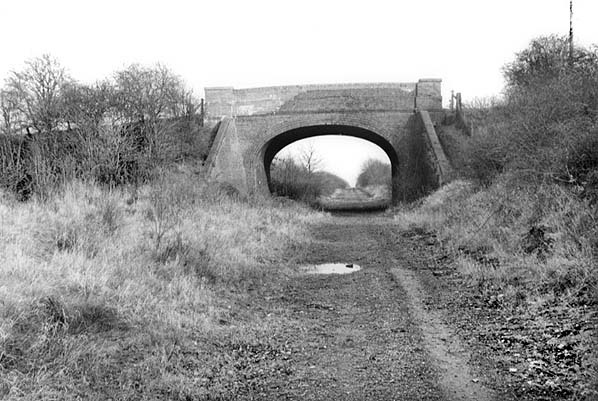 Looking west towards site of Bannister Green Halt in February 1975. The platform was on the left. 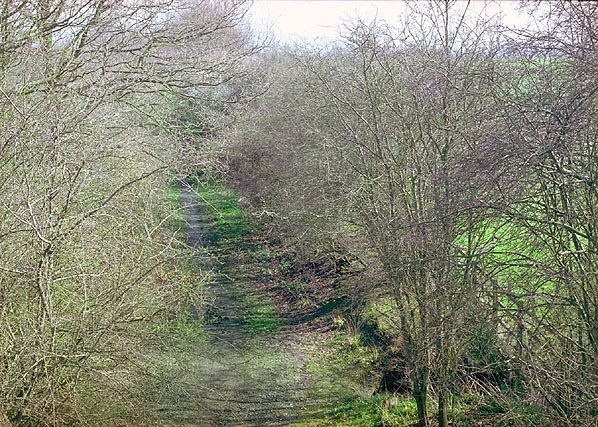 The site of Bannister Green Halt looking east in March 2002. The work to reinstate Bannister Green Halt is at an advanced stage in July 2011. The restored Bannister Green Halt in May 2014.